Sitting at the keyboard with henna painted fingers, my clothing infused with rich cumin, cardamom and ginger aromas, I am at a loss as to how to put into words this experience. Having arrived last Sunday night by plane, we came to Delhi in delirious anticipation for Ryan’s cousin’s wedding. A Minnesota born and bred musician, he had met his Indian bride in an African drumming assemble at Macalester and chose to follow the Bengali marriage traditions by meticulously organizing a five day wedding celebration in New Delhi, India. But no matter how much we had read on the city, and regardless of how many people we chatted with regarding the local customs and rituals, nothing could have prepared us for the complete chaos, enchanting beauty, cultural abstraction, exhaustion or elation we’ve experienced over the past week. From 8 hour musical and gastronomic gluttony under orange and white magnolia lined tents to the fear and excitement following the Mumbai bombings, our nerves and emotions have hit every possible chord in the human landscape. We experienced heartfelt traditional Hindu songs from 3 generations of women giving their love, adoration and hope to the interracial couple before marriage. Doors were warmly opened to 60+ family and friends who have flown from all over the world to experience this unique and awe inspiring event, among another 600+ attendees who arrived by plane, train, automobile, rickshaw and horse drawn carriage from across India. We chose to wear the traditional Indian wedding attire, which meant two very different outfits for both Ryan and I. For Ryan, he wore an orange silk long sleeve shirt which fell to his mid thigh, along with silk pants that were ridiculously tight around the ankles and huge around the tuckus – allowing for ample space to grow when eating from the 20 foot long buffet. For me, I wore a bindi (a dot or jewel placed on the forehead between the eyebrows that historically signified a woman’s age, marriage status, religious background or ethnic affiliation; however, the red dot still signifies marriage to many women), a silk hand-embroidered tunic that also fell to my knees, a long bead embroidered scarf, silk genie pants that where relatively baggy throughout, hands decorated in henna patterns of swirls, leaves and flowers, along with colorful bangles. We experienced a two and a half hour marriage ceremony (reduced from 4 hours for the westerner’s benefit) wrapped in Sanskrit words of love and peace for the couple, their community and the world, while attendees drank, ate and communed throughout the event. Put another way, imagine going to decked out garden wedding where the priest is chanting, singing and praying to the Gods with both the bride and groom under a brilliant red and orange tent of magnolias while you are milling around drinking, taking photos and listening to the tapa drum. It was the essence of experiencing without feeling pressured by one’s spiritual practices. 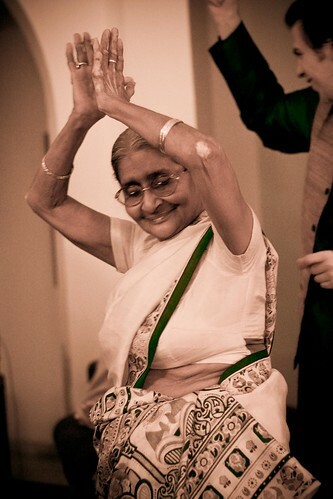 We watched the bride’s 80 year old grandmother dance to both traditional Bengali music and western techno, ate authentic Bengali food from the north of India, enjoyed long conversations over the customs and norms of both Hindu and Indian culture and saw traditional rituals that make many American celebrations seem rather vapid and meaningless. We experienced the art of handmade Persian rugs, made by two men sitting side by side at a loom and singing the various colors to one another while cutting each string at lightening speed. Tip: true Persian rugs should have a darker shade and a lighter shade depending on which end of the rug you are standing on. We learned that the descendants of those who worked on the meticulous and awe inspiring Taj Mahal, inlaying semi-precious stones in the translucent white Indian marble, to date, are selling their crafts. And although we didn’t meet the descendants, we did see the artwork in practice, where tiny slivers of precious stones are inlaid into the marble to make three dimensional designs of incredible detail. Tip: true Indian white marble used in this work is translucent, unable to corrode and very difficult to break. Finally, we were given a demonstration on what determines real Pashmina, a type of fine cashmere taken from the Pashmina goat in the Himalayas. Tip: Although even I can find “Pashmina” scarves here in Spain, only those scarves that can repel water for a length of time, as a result of the goat’s dander, is true Pashmina. (Keep watch of Ryan’s Flickr account in the coming days to see photos of these amazing crafts). How does one unite 1.2 billion people across 3.3 million square km, speaking over 21 official languages? Considering that India is one of the most culturally, linguistically and genetically diverse geographical areas next to Africa, I have no idea! Add the caste system (a social construct outlawed and therefore, “doesn’t exist” – wink, wink) to the mix, approximately 40% of the population living in poverty and over 1000 spoken dialects, and you have an incredible feat ahead of you. As for wine, we are sad to say that we only tasted a few producers, Sula being the one we enjoyed most often. Between “dry days”, as a result of the election, and the lack of local wine availability in general, our tasting was limited at best. We did, however, buy three wines: 2007 Zampa Syrah by Valle de Vin, 2005 La Reserve by Grover Vineyards and the 2008 Vin Ballet by Champagne Indage, which we will post on in the near future. As to other flavors we experienced traditional non-alcoholic beverages were both various and delicious. The Masala Chai is a very commonly offered hot beverage in most retail shops and restaurants. The black tea leaves are boiled in a mix of water, and whole spices such as ginger, cloves, cardamom and cinnamon, along with a large quantity of milk and sugar. The result is a milky, slightly sweet beverage that is utterly addictive! The second commonly offered drink is a complete antithesis to the first. Comprised of lemon juice, soda water, black salt and sugar, it is both refreshing and a perfect compliment to spicy Indian cuisine. 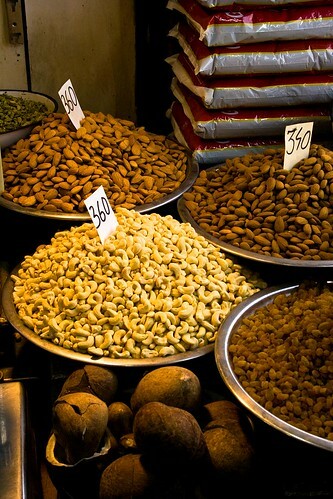 India’s food can be easily characterized by its rich flavors and subtle use of spices. And as a result of the longstanding vegetarianism within sections of India’s Hindu, Buddhist and Jain communities, it’s often thought that India is a vegetarian culture; however, we found this to be a HUGE misconception. Though it is a crime to kill a cow**, and most, if not all, “steaks” on the menu are water buffalo, we dined on incredible dishes of varied fishes, pork, mutton and chicken. Like Spain’s regional wine diversity, Indian cuisine varies widely by region showcasing the diverse demographics of the country. As the wedding party was primarily from Bangladesh West Bengal, known for its non-vegetarian cuisine, we were privy to a wide variety of meat dishes including chicken and mutton (not lamb, as elsewhere, but goat)! 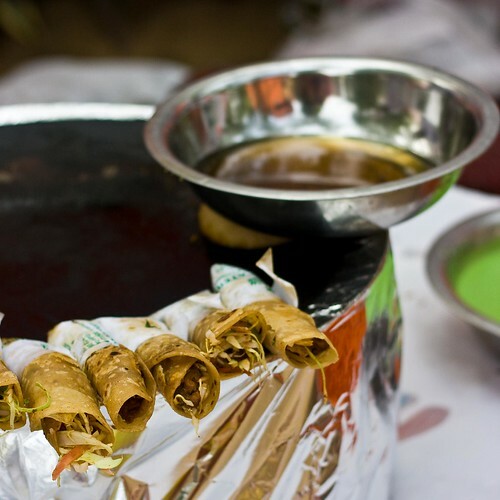 Bangladeshi cuisine is influenced by Afghan and Persian, North Indian cuisine also features the use of the “tawa” (similar to a grill) for baking delicious flat breads like roti (crispy and thin) and paratha (thicker and oily) as well as tandoor (a large wok placed on top of hot coals) for baking breads such as naan (commonly found in most Indian restaurants internationally) and kulcha. 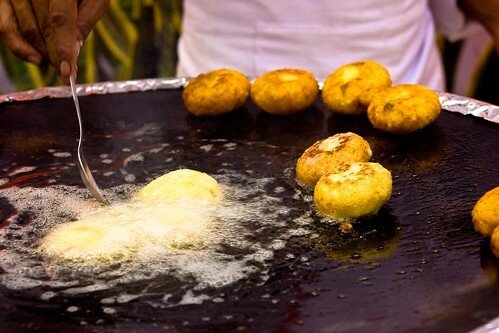 Other breads like puri and bhatoora, which are both deep fried in oil and served alongside main dishes. Bengali cuisine is also characterized by the ample use of dairy products such as milk (typically goat), paneer, ghee (clarified butter also used in the wedding ceremony as a sign of lasting hope when thrown on the fire), and yogurt are all common ingredients which can be found for breakfast, lunch or dinner. Most curries (known as gravies, are also commonly dairy based and use common spices such as chilli pepper, black mustard seed (rai), cumin (jeera), turmeric (haldi, manjal), ginger (adrak, inji), and garlic (lassan, poondu) , as well as leaves such as coriander, fenugreek (nenthi) and mint. 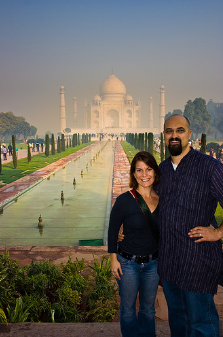 As for etiquette, we found many contradictions throughout our stay in India. Although told to never eat with your left hand as it is used to “clean” parts of the body, we noticed several business men using both hands while eating. 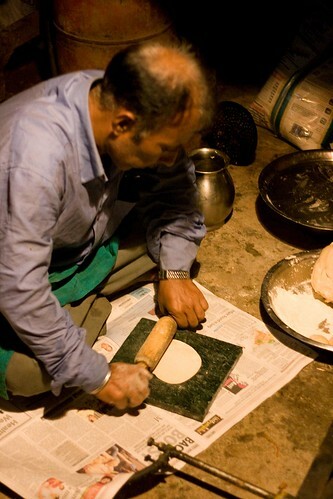 Forks and knives are commonly offered at both events and restaurants, but it is perfectly normal to use the traditional Indian bread as a scoop to absorb and pick up your food. And although your hands will be deliciously dirty, it is perfectly acceptable to be messy even in the heat of a conversation. We were also told that meals are traditionally eaten Indian style on the floor or on low stools; yet we never experienced this. We did see many flexible people casually sitting on their haunches throughout the region while chatting or eating, rather than on a chair, but did not actually partake in this traditional ourselves. As said, our experience was incredible, awe inspiring and provided plenty of food for thought. We have come back to Spain with new appreciation for what we have, which includes a very low pollution rate next to India, clean streets, more equality among genders and less poverty. However, there are many similarities between the cultures as well, such as a strong familiar base and a strong appreciation for food and music. We already find ourselves missing India, the warm and loving people, the incredible historical monuments and the rich cuisine, and look forward to returning in near future. However next time, we’ll head out of the city and towards their diverse green regions, which is slowly incorporating our favorite green plants – grapevines! Therefore, walking down the streets of Delhi, you will come various animals, both large and small, roaming the streets of Delhi without a home. What makes this story so heart wrenching is that these animals are abandoned, unfed and uncared for. However, because they are abiding by the Hindu ideals of non-violence, somehow the notion of caring for these animals has been missed in its communication. My question being: with so many people starving in India, is it right to let animals live despite their suffering?